Linguists will take exception to that and note that a cliff is, in fact, a bluff. 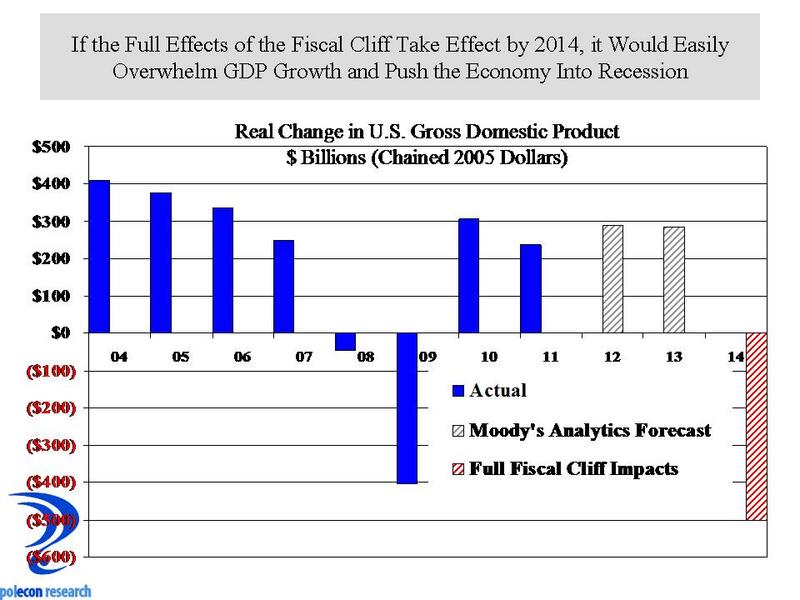 The consensus among economists, however, is that the fiscal cliff is indeed no bluff. A number of commentators have noted that the fiscal cliff is more like a slope and will not cause immediate economic calamity. I was one of those as a guest on NHPR’s “The Exchange“. But just as there was once too much hyperbole surrounding the fiscal cliff issue, now, as we get closer to the deadlines when the combination of tax hikes and spending cuts that define the fiscal cliff take effect, there seems to be more of an effort to minimize the likely impacts that will occur if no resolution is found. That would be a mistake because whether the spending cuts take effect immediately or over the course of a year or more, and whether the tax hikes immediately effect spending and investment decisions is not the issue. The issue is that the U.S. economy is simply not growing fast enough to withstand the impacts of the full implementation of the provisions of the fiscal cliff. Skeptics fire away, but below is a succinct chart that shows how the effects of the fiscal cliff relate to real growth in our nation’s economy, assuming the effects of the cliff occur in 2014. To lump all effects in one year isn’t accurate, but the point is to place the magnitude of the cliff’s impacts into context. I believe the context in the chart below highlights the importance of a reasonable resolution to the potential problems the cliff could cause. This entry was posted on November 27, 2012 at 10:50 am and is filed under Fiscal Cliff, Fiscal Policy, Politics. You can subscribe via RSS 2.0 feed to this post's comments. The operative word is REASONABLE …in my vernacular that means compromise to yield a balanced approach of spending reductions and income increases. There should be no sacred cows, as all must assist in this. The first step, in my opinion, should be a temporary “war tax” that specifically targets paying back the deficit spending that occured to fund multiple years of two wars. THAT would be a patriotic tax, and one that should diffuse the vitriol regarding new taxation!